Thoroughly mix all ingredients together, then pass through a sieve to remove any lumps. Pre-heat the oven to 180oc. Add a little oil to your Yorkie tray and heat in the oven until really hot. Pour in the Batter and return to the hot oven. The secret to perfect puds? Do not, under any circumstances, open the oven door for at least 15 minutes!! 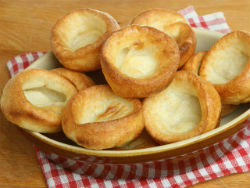 Once the puds are golden brown, carefully remove from the oven and serve with lashings of gravy!